A major advancement in composting toilet technology. Absolutely no odor. Clean. Hygienic. Welcome to Composting Toilets USA, a division of GreenLatrine Composting Toilets Ltd. This article will discuss composting toilets, waterless toilets, and answer the question: how do composting toilets work? It turns out they had. In Europe, composting toilets have been around for generations. Often called “waterless toilets”, they are installed in homes, offices and government buildings – wherever a toilet is needed. 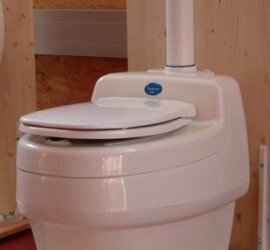 Contrary to a popular misconception, there is no unpleasant smell if a composting toilet is installed properly. North Americans have been much slower to adopt composting toilet technology. However, fresh water is becoming a scarce resource in many areas. It seems wasteful to flush away gallons of pure drinking water every time we use a toilet. In 2005, Americans flushed away 123 billion gallons of water, according to a U.S. Geological Survey report. A true composting toilet produces a safe, non-toxic final product that can be placed on ornamental plants. No expensive or energy intensive treatment is required, and no toxic sludge is produced. Best of all, once the composting toilet is installed, it costs almost nothing to operate. In a “urine separating” composting toilet, the liquid can be diverted to a gray water system or a small gravel pit (sometimes called a “French drain), where it percolates safely away. Urine is virtually sterile, and does not pose a health risk. The exact process varies depending on the composting toilet. Generally you have a traditional looking toilet seat and bowl, which sits above a storage tank. This tank may be built-in as part of the composting toilet, or it could be installed below the bathroom in a basement or crawlspace. Some of the newer composting toilets separate urine from solids. This is a big step forward. The relative lack of fluids in the storage tank helps eliminate odor. 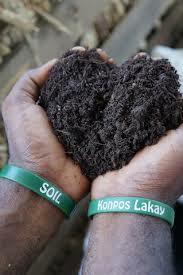 Complete and rapid composting occurs easily. Further dehydration over time allows the solid material to shrink dramatically (just like a compost pile). A small self-contained composting toilet can hold a surprising number of “uses”, meaning you do not have to empty it frequently. Excellent examples of urine separating toilets are the Nature’s Head and Separett. 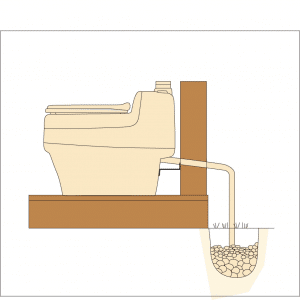 Most of the older composting toilet designs hold the urine and solids in one tank. Water evaporates with the aid of electric heat, with the same odor free results – at least theoretically. In practice, you must be very, very careful not to introduce more liquid than the unit can evaporate. Peat moss, coconut fiber, biological compost starter or other organic material is often added to the composting toilet to initiate and aid the composting process. In some toilets the solids are rotated, to speed up composting. With some simple home-made composting toilets you just cover fresh material with a layer of sawdust. This requires a LOT of sawdust, generally 1:1 with human waste, meaning you are adding and removing material much more frequently than with modern urine separating designs. It also means you have to store sawdust inside the home – not a great solution. Ventilation is required with all composting toilets. Commercially available composting toilets use fans to dry out the contents and prevent odor. These fans are usually very quiet – 30 db to 40 db. (Which is between a whisper and a refrigerator in volume). They usually run all the time, 24/7. The fans pull air from the bathroom area, through the composting toilet and out a pipe to the outside. You never smell anything, even when sitting on the open composting toilet. This is because the fan is pulling air away from you. Any odor is exhausted, and it cannot waft up into the room. When the solids bin fills up – and this can take between a few weeks and years depending on the type of composting toilet and how many people use it – you empty the already well-composted material into a suitable bin or container so it can “mature”. There should be little or no odor at this stage, other than a slight “earthy” smell. You can read a more detailed article on how to compost human waste here. How long it must sit is a matter of some debate. It depends on the temperature. Below about 12 degrees Celsius or 55 degrees Fahrenheit composting will slow or stop. Many experts believe letting the compost sit for 12 weeks at room temperature should render pathogens harmless. Others recommend a more cautious 6 months, or even 1 year or longer. It is then safe to use the finished compost on flowers or other non-edible plants. If absolutely necessary, as a last resort, you can bag and seal the solid waste from a composting toilet and and dispose of it in the trash. While this is not illegal anywhere I know of, it is not expressly permitted either. Throwing human waste in the trash is a bit of a gray area. However, I don’t see it as much different from throwing out disposable diapers. I suggest double bagging it in strong plastic bags if you must go this route. Composting toilets require almost no maintenance and are impossible to plug. Composting toilets are hygienic, inexpensive in the long run and environmentally benign. As fresh water becomes ever more scarce we are sure to see wide spread acceptance of this technology. The above discussion attempts to answer the common question: how do composting toilets work? Please also see the pages on how to safely compost human waste, Separett Waterless Toilets, and Nature’s Head Composting Toilets. Note: Canadian visitors can get important information here: compostingtoiletscanada. 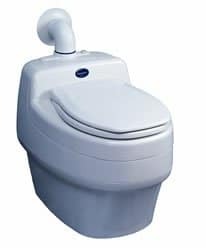 Composting Toilets USA is a division of GreenLatrine Composting Toilets Ltd. I was prepared to hate this thing, but I love it. This is easy, clean and odor free. Richard spent a long time with me on the phone and made sure it was right for me. No sales job! I was skeptical. But after 1 year I'm very happy. No odor in our 34 foot power boat. No pump outs! Richard spent a lot of time on the phone with me, and prevented me buying the wrong toilet (which I was about to do). The toilet has been in operation 6 months now, with no odor. This toilet does the job, but the fan failed after 2 months. That's why I only give it 4 stars. They did send me two more very quickly however, at no charge. 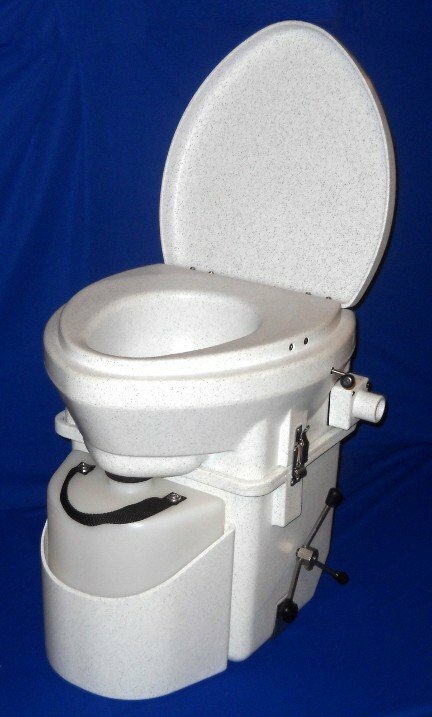 We recently purchased a Separett Villa composting toilet from Richard. The toilet arrived within days, complete with all the necessary accessories. We installed it as directed, but the fan did not work. I called Richard right away; he answered the phone; and the problem was solved. This was a Friday. By Monday, we received the new fan along with an extra roll of the plastic bags for the solid waste (thank you, Richard!). We just started using it today (Tuesday), and so far it works as well as advertised. We placed it in a show horse barn for client and staff use. After a few months, I'll let you know how it is working out. Prospects are good! PS: The fan is VERY quiet; I need to get down close to the toilet to hear it. Just received my natures head. Excellent quality with great service from Richard. I purchased this head to use on my sailboat that i live on during warmer months. No more holding tank or pumpouts with leaky pumps. Superlative is the only word I can think of to describe the service I received from this company. I'm so sick of being put on hold and given the run around. I called him 4 times with lots of questions, and he picked up the phone and patiently answered each time. The toilet is great by the way. No odor, works as advertised. I can't believe this kind of service actually exists anymore. Richard can actually be reached on the phone easily. He is very patient and answered all of my questions. He helped us choose the right model, then he talked to my installer about options for another 15 minutes! Richard walks his talk. Like a top professional in any field, he believes in what he offers and stands behind it with honesty, integrity, and good spirits. You can't go wrong working with him. I didn't think customer service like this existed anymore. Richard patiently spent about 40 minutes with me on the phone, making sure I understood everything, and chose the right toilet. Later, I had installation questions and Richard was right there on the phone. Both the Nature’s Head and the Separett Villa are 12 volt toilets that use very little power. Both would work well for you. 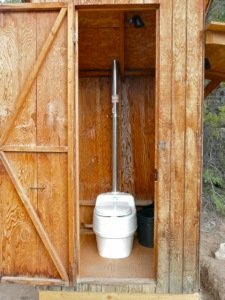 We are thinking about putting a compost toilet in a new house we’re building for my mother in order to save us from having to install a septic system…is this a good idea and if so which toilet would you recommend? I look forward to your thoughts on this. Yes it may be a good idea, but this is a huge topic that cannot be quickly addressed. There are many variables. Please read the site carefully, then call e with specific questions. We have property we are fixing to build a home on. The property will not perk so they say we need a high dollar special septic system. Been looking into composing toilets instead. What info could I look more into. On saving the money on not going with special system an going with composting. There are two toilets on my site that could work for you. Please read about them, and read the entire site to get an education on composting toilets. Call me afterwards. No odor if you vent through the roof. There may be slight odor near the vent if you vent through a wall. I don’t know the answer to the second part of your question. I have a very noisy SunMar. Does anyone know how the noise from other composting toilets compares? The Separett and Nature’s Head toilets are very quiet. We have a SunMar compact in our cabin. I have followed directions and it stinks like urine. We will use outhouse for other functions until we get the composting procedure down. I’m out of patience with ours. The fan is noisy. Even outside cabin. I’m frustrated and would like to find something quiet and not smelly! You need a urine diverting toilet. There is no odor at all. I am having to ship a composting toilet over to Hawaii, and Richard has been SO helpful getting my questions answered and helping facilitate a speedy shipment. 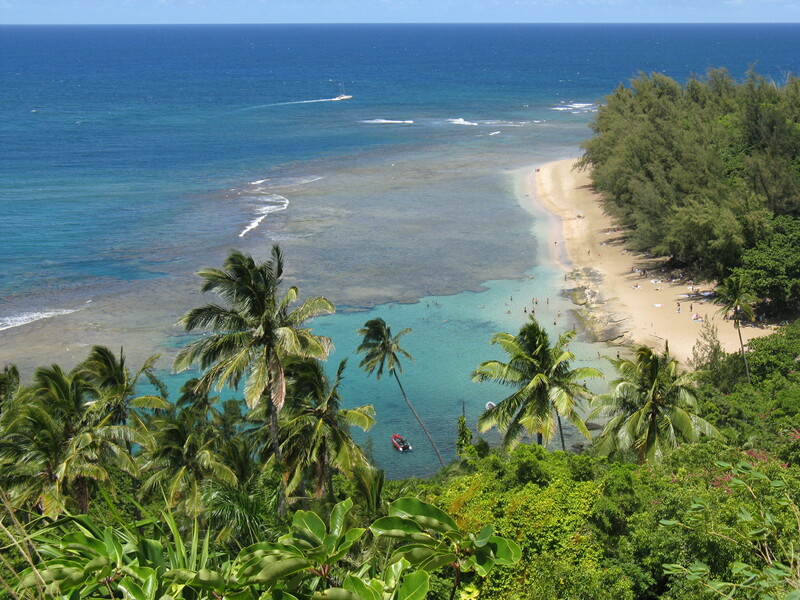 It’s costing more to get it there quickly (it IS going to an island in the middle of the Pacific, so…) but I am sure it will be worth it and solve some problems over there for us. I will let everyone know how the toilet works out for us, and if it is as great as it sounds, I will be ordering another one…but this time with a little advance notice so it can travel by boat! Thanks, Richard, for all the assistance and for running your biz “old school”. It’s such a rare thing to connect with the actual person running the business…even on a Sunday!!! That fact alone was enough to make me choose to do business with you! Mahalo! Can I use pine shavings as a compost material? We have never tried it. I do know that sawdust will not work. No harm in trying pine shavings, although I suspect coconut coir will perform better. In our travel trailer, I would like to replace our regular “RV” toilet with a composting one. I have a few concerns, though. 1) how do I vent it, and how do I power the vent? 2) Can it sit idle, and freeze, for months at a time? Do you have to do anything special when you start using it again? 3) We have a “wet” toilet/shower. Is it waterproof? 4)Can we mount it to the floor AND block the blackwater drain at the same time? 1) You vent it outside, through the roof (usually) or possibly through the wall or floor. You can call me to discuss. You power the vent with 12 volt electricity from your travel trailer, or use a solar vent. 2) Yes it can sit idle and freeze. No problem. Empty the urine bottle. Nothing needs to be done when you start using it again. 3) It is not waterproof. You need to protect the fan housing with a plastic bag when showering. Many people do this with no difficulty, as the shower in many smaller RVs and boats is shared with a toilet. 4) Not sure what you mean here. You will no longer need the black water drain in your bathroom area. What you do with it, I cannot say. We have a Nature’s Head in our RV. It is only a little taller than a regular RV toilet. We had it installed, but I could do it myself next time. We full time (2 people) in our RV and the bin needs to be emptied about once per month. 1) Our vent is a plastic hose that goes into the floor of the RV and connects to a tube that goes through the basement and outside. The end of the tube is covered with screening to ensure that dirt daubers don’t build a nest in the vent. If you put your hand under the vent, you can feel the air from the fan, but we never have any odor. 2) We haven’t left it idle for long periods of time. 3) If the toilet is closed up, the fan should be protected from the water as it is mounted inside the toilet and has a non-vented hose from that to your outside vent. 4) Ours is mounted where the old RV toilet was and the black tank is plugged (you can see the plug when you remove the toilet for cleaning). We had the blackwater tank sanitized and then mounted a leveling tube between the black and grey water tanks for when we’re boondocking and need extra grey water storage. This somewhat works, but not great. Our holding tanks are not accessible or I would just remove the tank. As it is, if we ever sold it and the new owners wanted to revert to a regular RV toilet, they just remove the tube and they’re all set. The Nature’s Head has served us well (almost two years now) and now I’m looking at composting toilets for when we have our next home. Fan. Fresh air exchange . With removal of contaminated air does this create a vacuum inside the air tight tiny house removing the heat and AC. Is the vent designed to push and pull fresh air? It does not create a vacuum, but you may need make up air, since it is drawing air from the home and exhausting it outside. The fan pulls the air into the toilet and blows it outside. The vent fan is a tiny computer/laptop type fan. It will not vent enough air to cause an issue. It’s pretty low tech. The front of the bowl is a big funnel, and the back is a big chute. When both men and women sit on the toilet, #1 generally goes forward and #2 goes back. That’s all there is to it. They can go in at the same time. You clean it with water, or water and vinegar. If the outside needs a major clean you can use a soft cloth and a NON ABRASIVE cleaner like soft crub, or a gel coat cleaner designed for acrylic shower stalls. I am very happy to learn about this delicate subject. I am looking to retire to an RV and this was very helpful. how much space do I need to change my RV toilet to this? Roughly 20 inches by 20 inches of floor space, plus room for your body. Precise dimensions are on the web page for each toilet. Call me if you need more information. how do you empty liquids? With the Nature’s Head the urine is collected into a bottle, and you dump that into a toilet, holding tank, gray water system, or drain pit. The Separett drains directly into a gray water system or drain pit. The Nature’s Head can also be plumbed to drain directly into a pit, with some creativity. Emptying liquids is pretty easy. The “jug” has a lid and you carry it from your bathroom to outside. If we are in a campground, we empty it into the septic system. If we are boondocking, we “spread” it around bushes and on the ground. It’s about two gallons so we don’t put it all in one spot but, basically, it would be like “going behind a tree” when you’re tent camping or hiking. would that not leave a smell after a while? Would what leave a smell? There is no odor whatsoever with the toilet if it is properly installed and used.